If you've started thinking that Veggie Terrain has taken a sudden - and not too subtle - shift towards focusing on New York City, well, you'd be correct. What I failed to realize, however, is that I never explained why! Back in July, via my Twitter account (@VeggieTerrain), I shared the exciting news that CH and I were relocating from the Chicago suburbs to NYC. The one problem is, I completely overlooked that many of you who follow my blog don't also follow me on Twitter, and vice versa! Therefore, some of you must be slightly confused (annoyed?) that NYC has become the darling of Veggie Terrain as of late. The only explanation I have is that I'm absolutely enamored with this city - the diversity, culture, neighborhoods, restaurants, museums, fashion, parks, food carts, buildings, etc., etc. And although that love will probably be shading my posts for a while, please don't think the recipes are gone. My genuine hope is that these NYC-based posts will help those of you who visit the city and are looking for some kind of vegan guidance (although almost any direction you go will be "safe" in that respect). So, this is my humble request that you bear with me. Much like with any new affair, the shiny-newness of it all will start wearing off soon enough. 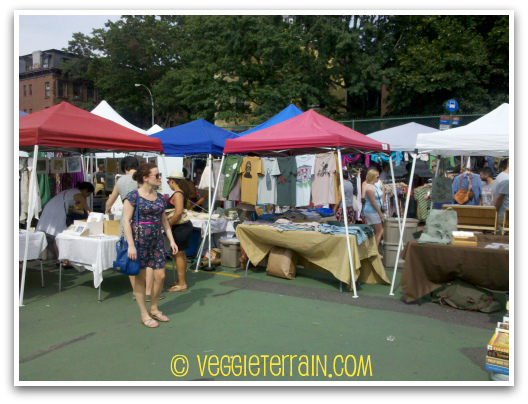 Pictured in the shots above are some of the vendors at the Brooklyn Flea, while the shots below are from Smorgasburg (both are in Williamsburg, Brooklyn). 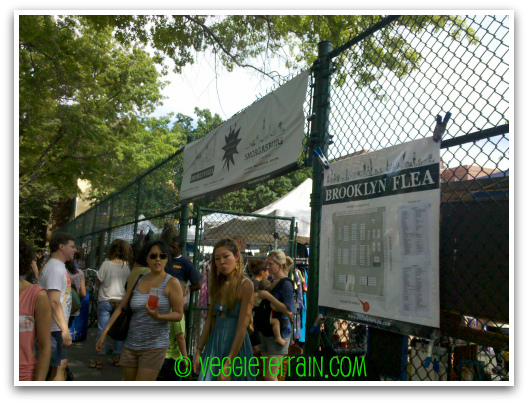 The flea market is stuffed with vintage clothing, antiques, hand-made goods, furniture, records, and jewelry, while the Smorgasburg is more food-focused. There, you'll find kitchen items and a variety of gourmet (and not-so-gourmet) food offerings, such as home-made pickles, vegan baked goods, breads, teas and sodas, salsas, jams, fresh produce, aaaaannnnddd... the "sweet, sweet" part of this post: locally-made, fruit-based popsicles from People's Pops! The absurdly creative pop menu at Smorgasburg when CH and I visited was as follows: Nectarine Basil, Blueberry Apricot, Plum Tarragon, and Blackberry Sour Cherry. Now, I'll be the first to admit - I'm not the biggest nectarine fan. However, I couldn't easily dismiss the thought of having basil in a sweet treat. 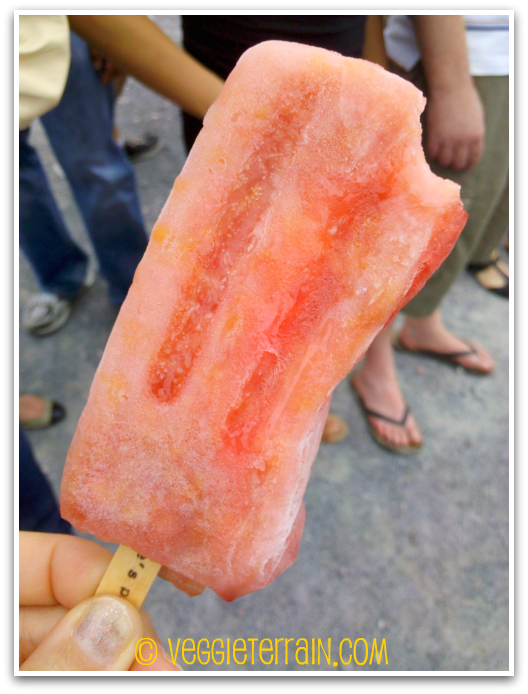 Plus, I figured it was probably safe to trust the People's Pop guys' flavor-combining prowess, so I went for the nectarine basil pop. 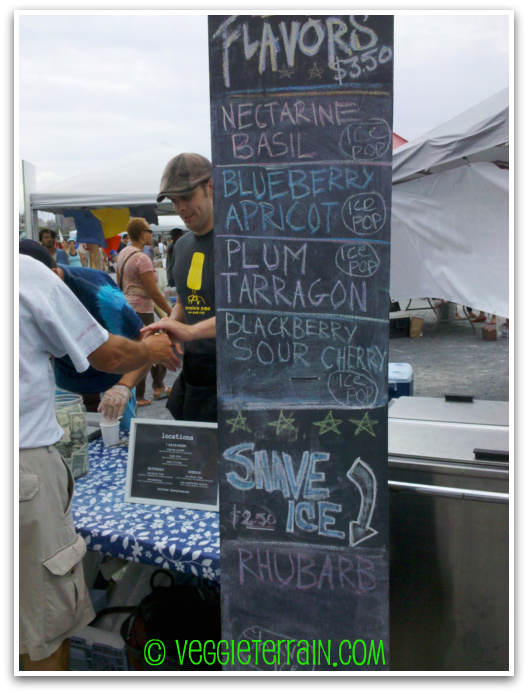 By the way, CH's blackberry sour cherry pop was amazing as well - he just slurped it up too quickly for me to snap a photo!